THE arrest of its leader has made the anti- posco group in Orissa more resolute. People of Dhinkia, among the three villages to be affected by the proposed steel plant, have dug up roads to the village to prevent the police from entering. 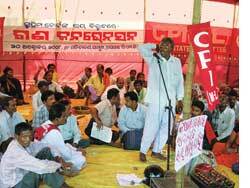 The Communist Party of India, the party arrested leader Abhay Sahu belongs to, has threatened a statewide agitation. "If the administration tries to use force against us it will be a repeat of Kalinga Nagar," warned Sishir Mohapatra, general secretary of Posco Pratirodh Sangram Samiti, the organization spearheading the movement. Mohapatra is in charge of the movement after Sahu's arrest on October 12. Sahu had led the movement from Dhinkia for almost three years. Gandharp Das, a local activist, said that Dhinkia resembled a fortress but the agitators were in high spirits. "We are not going to leave the village out of the fear of getting arrested. We are all united and determined to carry on the battle. People of Dhinkia will be the biggest losers if the project comes up. We have the biggest betel vines that stand to be affected, and we cannot survive without these vines," he said. Jagatsinghpur Superintendent of Police R K Sharma said the situation was under control and eight platoons of police were deployed in the area.